“Brownie Mary,” an inspirational and brave woman who blazed the trail in the fight for safe access to medical cannabis right here in San Francisco. The following is an excerpt from her Wikipedia Page. Mary Jane Rathbun, known as Brownie Mary, was an American medical cannabis rights activist. As a hospital volunteer, she became known for baking and distributing cannabis brownies to AIDS patients. Brownie Mary was arrested on three occasions, with each arrest bringing increased local, national, and international media attention to the medical cannabis movement. Her grandmotherly appearance generated public sympathy for her cause and undermined attempts by the district attorney’s office to prosecute her for possession. The City of San Francisco eventually gave Rathbun permission to distribute cannabis brownies to people with AIDS. Her arrests generated interest in the medical community and motivated researchers to propose one of the first clinical trials to study the effects of cannabinoids in HIV-infected adults. 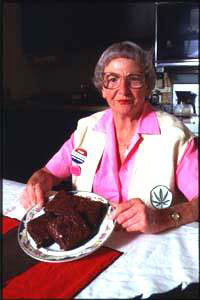 Brownie Mary lobbied for the legalization of cannabis for medical use, and she helped pass San Francisco Proposition P (1991) and California Proposition 215 (1996) to achieve those goals. She also contributed to the establishment of the San Francisco Cannabis Buyers Club, the first medical cannabis dispensary in the United States.